An enjoyable walk from Mickleton following the Tees Railway Walk to Romaldkirk and the Balder Viaduct before returning via Hury Reservoir and Millstone Grits, the summit of Romaldkirk Moor. This was my third walk in a row in Teesdale following recent visits to Goldsborough and High Force. 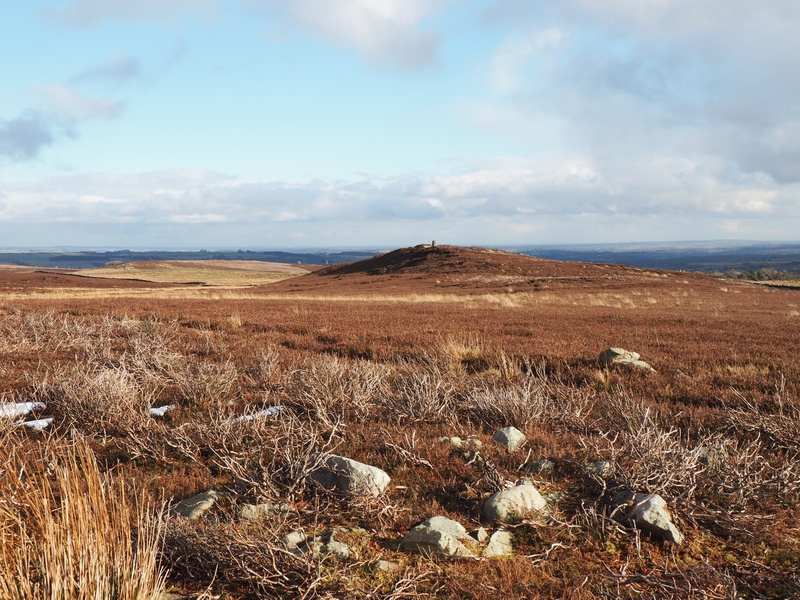 The main purpose of this walk was to visit Millstone Grits, the highest point of Romaldkirk Moor. The summit is one of nine hills in the North Pennines between 400-499m that I hadn’t yet visited. To add variety to the route I decided to make use of a sizeable section of the Tees Railway path as part of a route that would also include sections in Baldersdale and Lunedale. I started the walk from a very handily placed car park which is located right on the Tees Railway Walk just a few hundred metres outside of Mickleton. The Tees Valley Railway opened in 1868 and linked the dale with Darlington and Bishop Auckland. The line was closed during the Beeching Cuts in 1964 and the car park is situated on the site of Mickleton Railway Station. The walk south towards Romaldkirk was very pleasant on what was a generally very easy surface underfoot. The very slight elevation of the line above the villages meant that there were good views across the valley to the likes of Monk’s Moor, Millstone Rigg and Grey Carrs. At Romaldkirk the way is briefly diverted through the village. I took advantage of this to have a little potter about the village. Points of interest include the old signal near where the station once stood, an 1866 water pump and some stocks on the village green. Most interesting of all though was the church from which the village takes its name. Dedicated to the obscure Saxon saint, St Romald, the church contains a 12th century font, some fine stained glass and the tomb of Hugh Fitz Henry, a knight of Edward I’s. On the church tower is a fine clock which marks Queen Victoria’s Diamond Jubilee. For Ordnance Survey fans a cut benchmark can also be found at the foot of the tower. Having had a good look around I rejoined the Tees Railway Path to continue south. It had been a cloudy start to the day and, somewhat unexpectedly give the forecast, the skies now began to break allowing for some welcome sunshine. I continued along the path as far as the Balder Viaduct where I stopped to take a few pictures. Retracing my steps a short way I then took a path heading up Baldersdale for the farm at West End. With the exception of a huge pile of cow manure at West End the walk towards Hury Reservoir was very pleasant through largely empty fields. Shortly after crossing a stream on a very dodgy look footbridge I arrived at the farm with the unusual name of Lanquittes. Following the drive down to the road I briefly walked alongside the River Balder and got a good view of the river’s waters dropping down the spillway from Hury Reservoir. Walking up the road I made a brief detour to the parking area at Hury Reservoir so I could get some photos of the reservoir. Back at the road I continued uphill passing Strathmore Arms Farm and East Thorngarth. Just beyond the latter I paused to stroke a friendly horse who stuck her head over the neigbouring wall. Reaching a road junction I crossed directly over to take a footpath climbing up to some old quarry workings. A faint grassy path continued on to reach the larger workings at Scaletree Quarry which was now largely grassed over. Just below Scaletree Quarry I was very annoyed to find that a local landowner had strung barbed wire right across a ladder stile. During this section of the climb I’d hoped to get some nice retrospective views of the chain of reservoirs in Baldersdale. The very gentle gradients however meant that the reservoirs remained disappointingly out of sight. Above Scaletree Quarry the condition of the ground underfoot deteriorated dramatically. There was brief bit of respite when I crossed the enclosed Botany Lane. Beyond the latter the ground got even worse and looked like it had been heavily trampled by cattle. I didn’t quite follow the path up to the next wall. Instead I walked slightly to the left to a wall junction where a broken section of wall conveniently gave me access to the heathery summit of Romaldkirk Moor on Millstone Grits. Whilst the climb up from Hury Reservoir was slightly disappointing, the top of Millstone Grits far surpassed my expectations. The views back down to Teesdale were quite superb. Prominent in the view were the likes of Harter Fell, Westernhope Moor, Monk’s Moor and Grey Carrs. After spending some time taking photos from the trig point I went in search of the actual summit which is about a metre higher. I found this on a heathery ridge just to the north-west. Here I had the best view of the day, a stunning view down into Lunedale. From the summit I descended through the heather heading towards grid reference NY954223. I guessed this would be the most likely place to find a gate on to the road. The going was a bit rough underfoot but sure enough there was a gate exactly there. Once on the road I followed it downhill with lovely views of Lunedale ahead of me. Just before reaching the road junction I visited a quarry where I sat down to finally eat some lunch. At the road junction I crossed over to take a path slanting down through sheep pastures. After crossing Eller Beck a short climb brought me to the drive at The Acres. This led me on to Cote House Road and the beautifully presented Westfield House. Turning right along the road I soon reached the Tees Railway Walk once again. Turning right along this it was then a nice easy stroll back to the car just outside Mickleton.